Integrated Systems Europe (ISE) took the world by storm in 2019, as those involved in the AV industry descended from all corners of the globe to celebrate another year of innovation and success in Audiovisual technology. Experts and enthusiasts alike flock to Amsterdam each year in order to participate in ISE, and this year saw it reach record levels of ambition and scale. Turning to its expert AV partners, ISE took on one project in particular that couldn’t fail to turn the heads of attendees and passers-by. With the huge focus on projection mapping this year at ISE, an ambitious projection mapping project is the perfect way to demonstrate how far the AV industry has come in recent years. 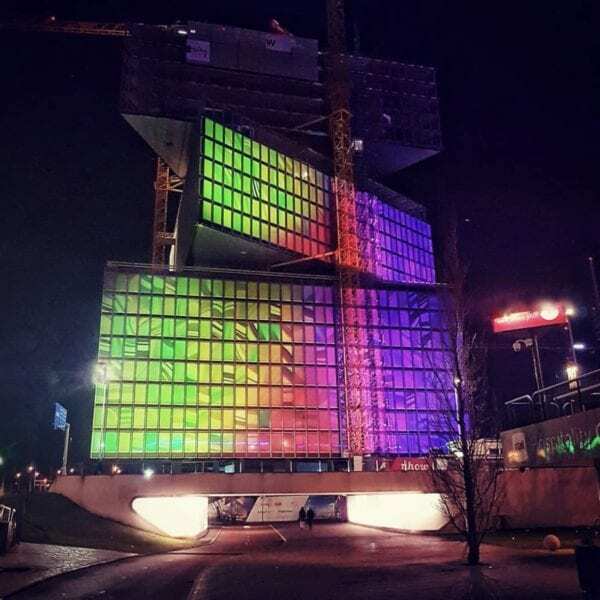 Such a project was perfectly exemplified by the incredible projection mapping installation on the façade of the new nhow Amsterdam RAI hotel, which is adjacent to the location of the ISE exhibition. 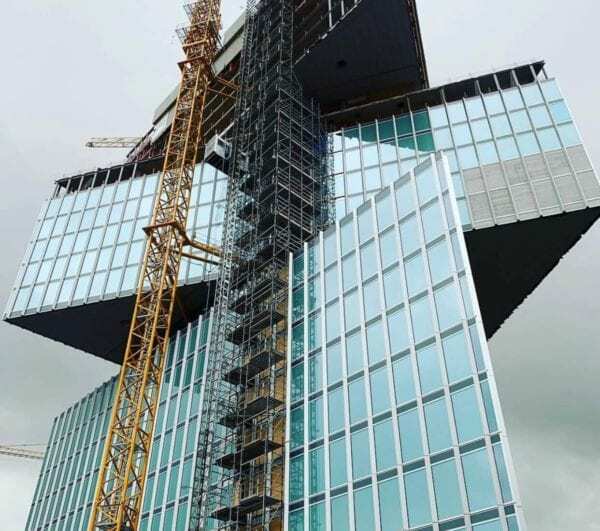 The impressive 25-storey hotel boasts 650 rooms and was developed following a tender process by the City of Amsterdam and the RAI that began all the way back in 2014. Now, after 5 years in the making, those involved in establishing this incredible building can see their vision come to life during the week of ISE through a very special projection mapping project developed by ISE and its partners, each one serving as specialists in their field, working in synergy to deliver this remarkable installation. This ambitious display required input from a range of experts in order to successfully complete the project which was managed by LANG, hire and production specialists. 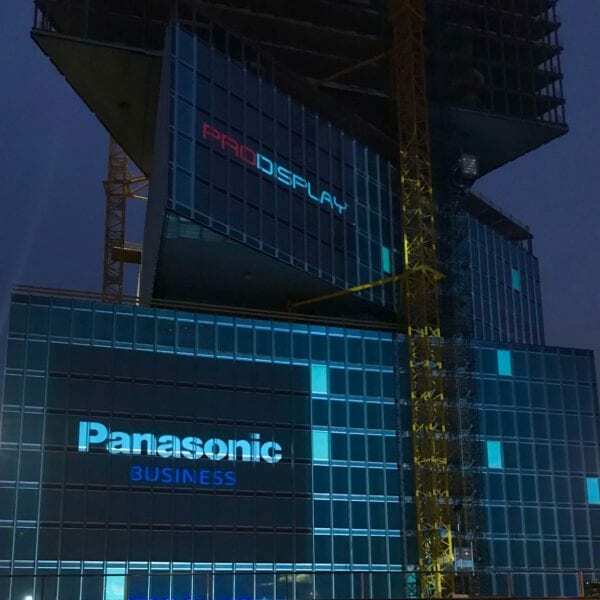 They called on 14 of Panasonic’s PT-RZ31K projectors to provide the 400,000 lumens needed to project the mapped content onto 392 windows of the uniquely shaped building. 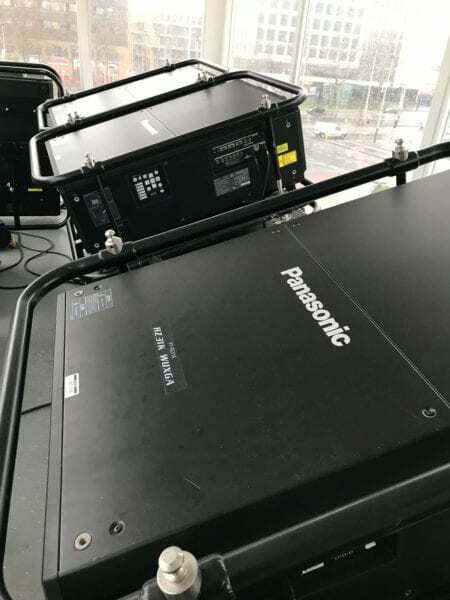 3D-mapping specialists Tenfeet worked in partnership with media server specialists, Green Hippo to deliver the content and of course, Pro Display developed, supplied and installed the projection film required to make image reproduction possible. This incredible projection mapping project was the culmination of a lot of hard work, expert know-how and experience, and Pro Display’s input in this enormous display was crucial. The Projection Mapping Film is a removable dry application self-adhesive film that enabled the windows on the nhow Amsterdam RAI Hotel to receive and display the content being projected onto them. The film was essential in this window projection system in order to combat the glare and lack of image reproduction that standard glass would produce when being projected onto. 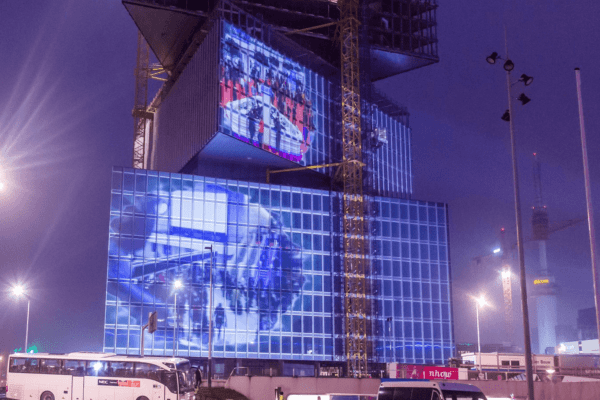 Pro Display’s film offered a solution to a very challenging aspect of the project – how to create a multi-storey projection screen that spans across 392 windows on an irregularly shaped building. Using Pro Display’s Projection Mapping Film, the architects of this project were given an easy solution to the issue, offering a film that was able to be installed via the interior of the building. A front projection system can be problematic for window displays; a film that can pick up and display an image through glass is not conventional, so in this case, a specialist projection solution such as Pro Display’s Projection Mapping Film was required. Using a traditional projection film would have required the film to be installed onto the outside of the glass windows, monumentally complicating the installation process. Moreover, due to the scale of the project, it likely would have necessitated the use of cranes to install the film across the massive surface of the building. In many cases, a rear projection system would be recommended instead in order to simplify the project, but here, projection across the façade of the building was required so a rear projection system would not have delivered the desired result without significant financial implications. It is this aspect that makes this film so special – allowing Pro Display to proceed with installing the film onto the interior of the 392 windows with surprising ease, speed and cost efficiency. 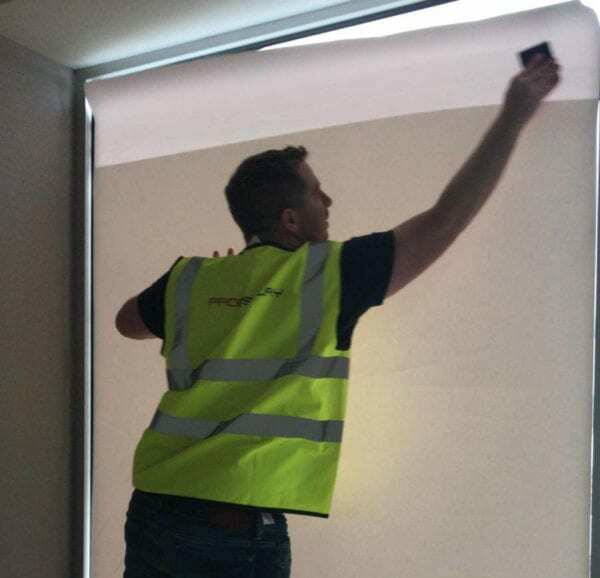 Mike Blackman, the founder of ISE refers to the challenges himself, commenting in an interview with InAVate’s ISE 2019 correspondent, Paul Milligan, ‘One of the issues we had was the reflection on the windows, or rather lack of reflection, and Pro Display came in and did all the foil for the windows. So there was almost 400 windows that have been coated last week with the foil to actually create the projection surface […] it’s something that really marks us on the map for projection mapping.’ Milligan, obviously appreciating the scale of this project remarked, ‘It’s great to see so many big names all working together to produce this’. There is simply no better way to represent and mark the celebration of AV innovation than to work on a project like this, championing the essence of professional co-operation and working towards one of the biggest projection mapping projects the world has even seen. Pro Display are incredibly proud of the part we have had in this project, strengthening bonds with ISE, Mike Blackman and ISE’s partners. To see the final installation in all its glory is a true testament to what can be achieved by experts in the AV field. It offers a great demonstration of the sheer power of projection mapping and how far the industry has advanced in recent years.